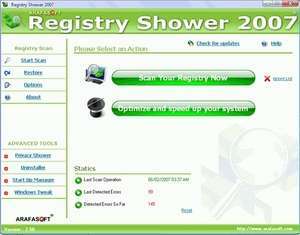 Registry Shower 2008 is powerful tool for cleaning Registry, Fixing PC errors and optimizing PC for better performance. Registry Shower 2008 Cleans and Repairs Your system Problems with safety Methods. Cleaning and Repairing Your PC Registry with full safety complex algorithms. Optimize your Windows for high performance of your computer. Registry Shower 13.2 is a shareware program and can be used as a demo to try the software until the free trial period has ended. A full version of the program is available after the trial period ends. For security reasons, you should also check out the Registry Shower download at LO4D.com which includes virus and malware tests. Additional screenshots of this application download may be available, too.